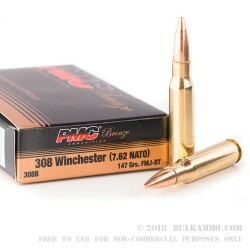 This .308 Winchester ammo made by PMC is an excellent choice for getting accurate shots from your rifle at the range or in the field. Made to exacting specifications, these rounds come 20 to a box and propel a 147-grain boat-tailed full metal jacket bullet at 2,780 feet per second. Each round is cased with boxer-primed reloadable brass. Poongsan Corporation, the makers of PMC ammo, have manufactured high quality ammunition products since the 1960s. The company's large production capacity has ensured that its products are available in large quantities to its primary customer, the South Korean military, as well as the American shooting sports market. 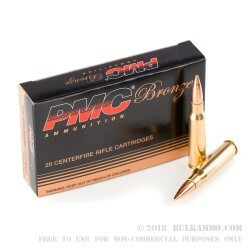 PMC ammo has achieved success in the US thanks to the company's strong focus on quality control and ability to deliver good ammo at low prices. Very good ammo, accurate, and well priced. Great ammo!! And fast shipping!!!! 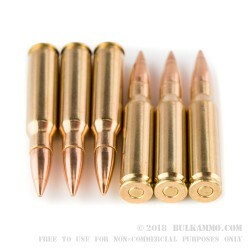 I just have to say bulkammo.com is a great place to buy ammo! I just randomly stumbled upon this website and I don't regret it. I placed my order and the same day it was shipped out! I live in the west coast and got it in 4 days! That's faster than eBay shipping haha! I bought this ammo to try in a new Savage model 10 bolt action rifle with a 1:10 barrel. The ammo shot very clean, I didnt have to work very hard to get the patchs to come out clean. I didnt have any rounds fail to fire. I was shooting the rifle from a bench rest and at 100 yards was getting very inconsistant groupings, anything from 1 to 4 inch groups. Q: Is this ammunition steel core or lead core? In other words, will the projectile stick to a magnet? I live in CA and they will not allow steel core ammo because of the fire hazard. Thank you. A: These rounds are lead core and will not attract a magnet. You should be good to go to shoot these in California. A: Generally speaking, the 308 round should be fired only in a 308 chamber/barrel. Most manufacturers, like PMC, will load their 308 rounds to be acceptable in both 308 and 7.62x51 rifles, with a loading closer to the 7.62 round. (This is similar to the .223 Rem and 5.56 NATO differences). Special attention should be taken with older rifles as these chambers designated for the 7.62 round may not safely tolerate a 308 round. Q: Any reports on how this boattail will reform in a PTR91? A: In a PTR-91, this should perform similarly to any other 147-150gr FMJBT projectile.